To begin with, this trip was all about getting away. It was about time on the other side of Asia, travelling from one mega-city to the other, covering six cities in five weeks, immersing myself in the exoticism of foreign cultures, foreign cuisines and foreign cityscapes. I decided - and it wasn't a difficult decision to make - to temporarily detach myself from the unbearable Israeli news cycle, from the mounting sense of despair and nausea at what my country was deteriorating into. As it turned out, it was easier said than done. While I made a conscious decision not to go online and check Israeli news websites and stuck to it, some things were too dramatic to sidetrack. I was in Calcutta when news came in about the stabbing attack on a Tel-Aviv commuter bus. But the India experience is so intensive and overwhelming that even this was soon forgotten. It was what followed that really drove the point home that when you come from Israel, you take your country with you wherever you go, more so than with other countries. As holder of a non-Israeli passport, I decided to spend a few days in Dhaka, the enormous and chaotic capital of Bangladesh. Bangladesh, a Muslim country, strictly refuses entry for Israelis, while stating in its passport that it is "valid to all countries in the world except Israel". I made it to Dhaka with no hitch and spent a week experiencing its mad, unrelenting tempo. What made me sad was having to lie to people about my country of origin. This was a lie I had to repeat many times every day since dozens of curious and kind Bangladeshis came up to me on the street, in restaurants and at the ubiquitous tea stalls and struck up a conversation. Those to whom I decided that telling the truth was a calculated risk usually fell silent for a moment, then advised me to keep on lying to the others. It was obvious why. While Bangladesh is not an Arab country and is not part of the Israeli-Arab Conflict, it is indeed a Muslim-majority country, and one which was born out of two civil wars, the first of which was fought against Hindus in the mid-1940s. Many Bangladeshis ended up in what we now call Bangladesh having had to flee their ancestral homes in what is now the state of West Bengal in neighbouring India. It is easy to see how as Muslims and as former refugees many Bangladeshis could relate to the Palestinian narrative. There are also external factors at play: Saudi Arabia is a major donor to Bangladesh, and many Bangladeshis live and work in a host of Arab countries in the Persian Gulf area, where anti-Israeli sentiments run high. 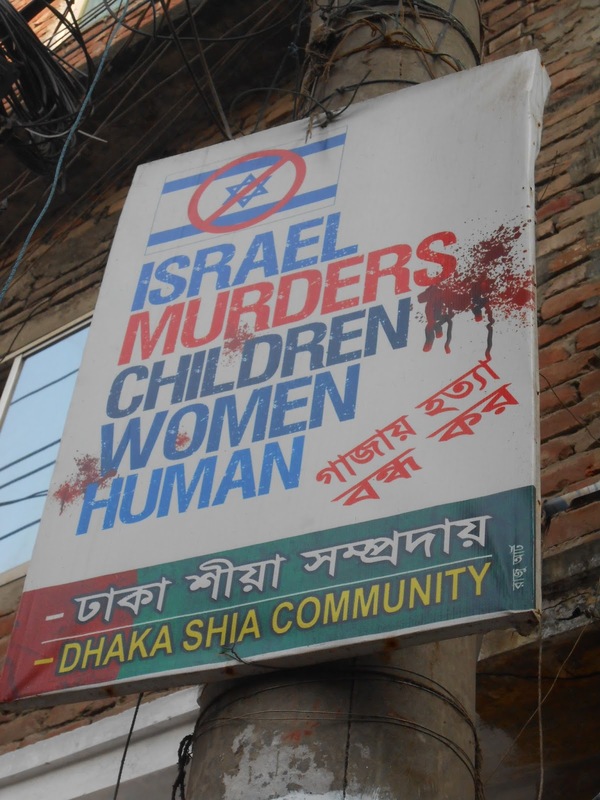 A particularly unpleasant moment in Bangladesh was coming across this poster in a poor Shi'a community in old Dhaka. 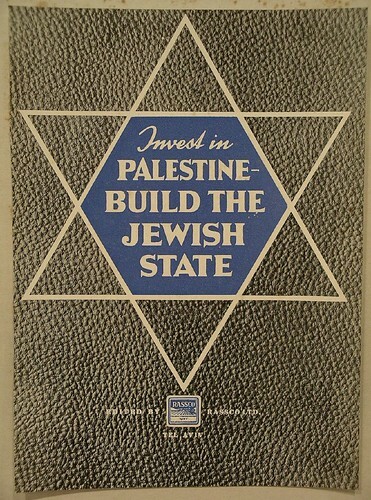 Sadly, one comes across similar posters in Western capitals, too, but there they actually have an audience. In Dhaka, for the entire week I spent in it I was almost the only Westerner around, and yet the leaders of this Shi'a community took the trouble of producing, and putting up, English signs of this sort (there were more than just the one). I imagine this only goes to show how strongly people felt about this, while conducting their daily, hand-to-mouth lives thousands of kilometers away from Israel/Palestine. Another country visited on this trip was Malaysia, another Muslim-majority country which does not welcome Israelis or allow its own citizens to travel to Israel. Much like Bangladesh, it wears it on its sleeve but stating so in its passport. To make things worse, Israel is the only country in the world Malaysians are not allowed, by their government, to visit. In Kuala Lumpur, the thriving, space-age capital, one Muslim man gave me a surprised "hmmph" when I told him where I was from and then turned away in protest, bringing our brief conversation to an abrupt, awkward end. And one meat seller in a busy market waved his knife at me but smiled as he did so, then asked to have his photo taken with me. Compared to Bangladesh, Malaysia is not only a wealthy country, but also quite progressive. 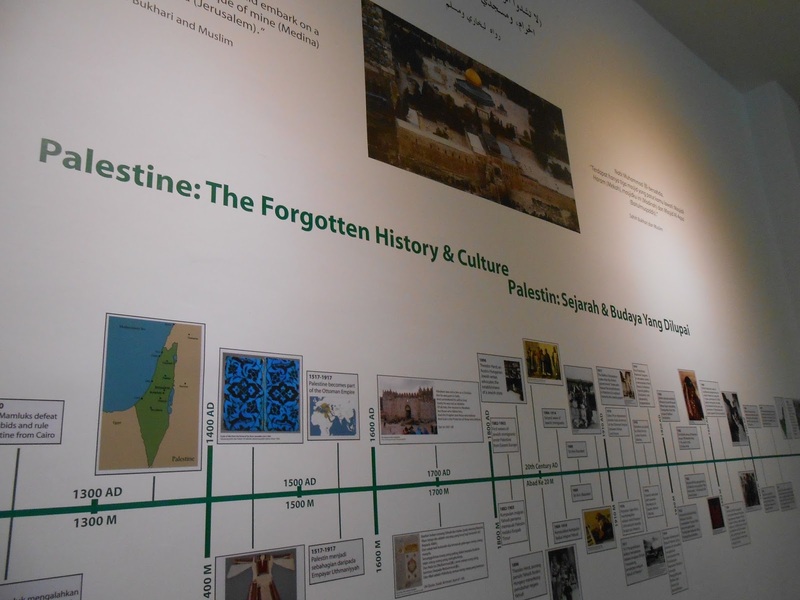 In the outstanding Islamic Arts Museum in Kuala Lumpur an entire wall was dedicated to Palestine and its "forgotten history and culture". Reading the accompanying texts I was pleasantly surprised at their even-handiness when describing the tragic history of this land. I was also surprised to see Malay travel agencies arranging pilgrimage packages to Jerusalem. 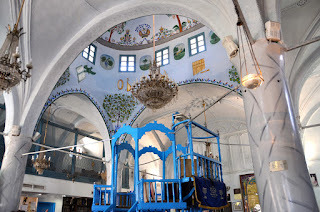 Going online, I was pleased to find that despite the ban on travelling to Israel, Muslim pilgrimage is allowed, and was recently even extended from 10 to 21 days; this gives reason to believe that when coming here Malaysian pilgrims do not limit themselves to Jerusalem only. Thus, while I felt bad hailing from what was clearly a hated, leprous country, at least Malaysia gave me more than a glimmer of hope. Eldad has an M.A. in geography and urban and regional studies from Hebrew University and is a licensed tour guide. He was born and raised in Jerusalem and specializes in guiding the Greater Jerusalem Tour and walking tours of the Old City. His passion is the post-1967 'geopolitics' of the area and has written extensively on the subject. Most notably his 2006 paper, 'Politically Oriented Tourism in Jerusalem' published by Sage in the academic journal, Tourist Studies. Eldad's tours of Jerusalem provide a comprehensive overview of the contradictions inherent between the slogan, 'an Undivided Jerusalem', and the 8-meter high wall that slices through Palestinian neighborhoods and the segregated roads around the perimeter of the city. More information about Eldad Brin can be found at this link.